The following previously newsletter-exclusive short stories and deleted scenes are now on my website: Home, A Sip of Eternity, Hide and Seek, Grocery Shopping, and a deleted scene from Archangel's Shadows. A number of other stories connected to all three of my series, remain newsletter exclusive - you can access these by signing up to receive the newsletter monthly. Speaking of which, I need to figure out what special goody to put in the Nov 5 edition. Hmm... Suggestions? I have a book rec for you today. 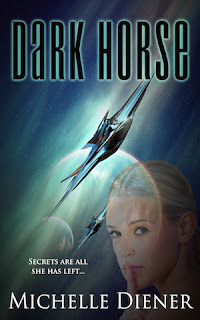 I loved, loved DARK HORSE by Michelle Diener!! It kept me up way too late last night. It's a science fiction romance with great worldbuilding and a wonderful romance between two characters I truly liked. The blurb is below and here's a link to the book's Amazon page - you can click the cover to look inside the book and read an excerpt. Any of you already read it? What did you think? t her story is adding up, and Dav has a bad feeling his crew, and maybe even the four planets, are in jeopardy. The Class 5’s owners, the Tecran, look set to start a war to get it back and Dav suspects Rose isn’t the only alien being who survived what happened on the Class 5. And whatever else is out there is playing its own games. This is my ensemble cast book where everyone comes back. :) The official blurb should be finalized by the November 5th newsletter, if not sooner. A late Friday Book Club this week. What are you currently reading and loving? 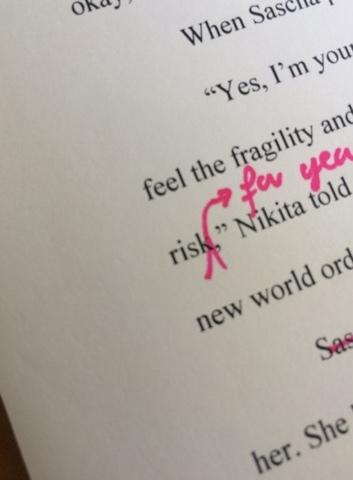 A snapshot of the scene I'm currently editing for the next Psy-Changeling book. I did a Google Hangout as part of the Gollancz Festival this weekend, answering lots of reader questions about all three series. Here's the recording! I hope you enjoy. :) p.s. I read out the question before I answer it, so you can skip anything that is a spoiler for you. Woohoo! Time for the Friday Book Club! What are you reading and loving this week? Repost from my Instagram for those of you not on IG. 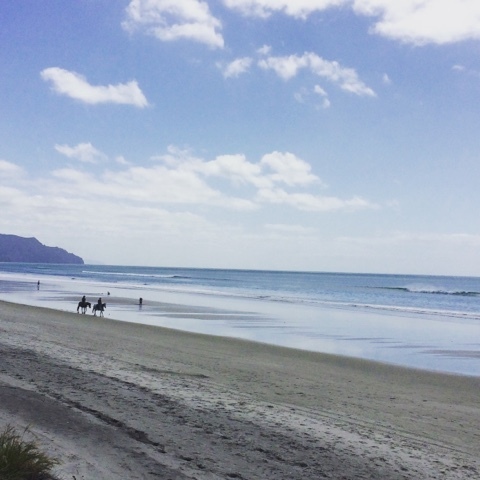 New Zealand really has the most astonishingly beautiful scenery. It still startles me sometimes. This is where you can discussion Rock Redemption and the other books in the Rock Kiss series, with *SPOILERS*. This is a reader thread, so if you have questions for me, please email. As always, be kind and respectful to one another, and have fun. So I just checked my emails after being offline for a couple of hours (writing) and found this! ROCK REDEMPTION is currently #1 on iBooks Australia and iBooks New Zealand!! When it comes to friends-to-lovers stories, this is one of the most compelling ones I have ever read, flawlessly written as always, and utterly captivating cover to cover. The final pre-release excerpt is now up at Natasha Is A Book Junkie, along with an amazing review! If you're avoiding all reviews at the moment, just scroll down past the stars at the end of the review to get to the excerpt. What are you reading and loving this week? I just finished Ann Cleeves' The Moth Catcher. I really enjoy the Vera mysteries and this one was no different with its twists and turns - and the wonderful recurring cast. 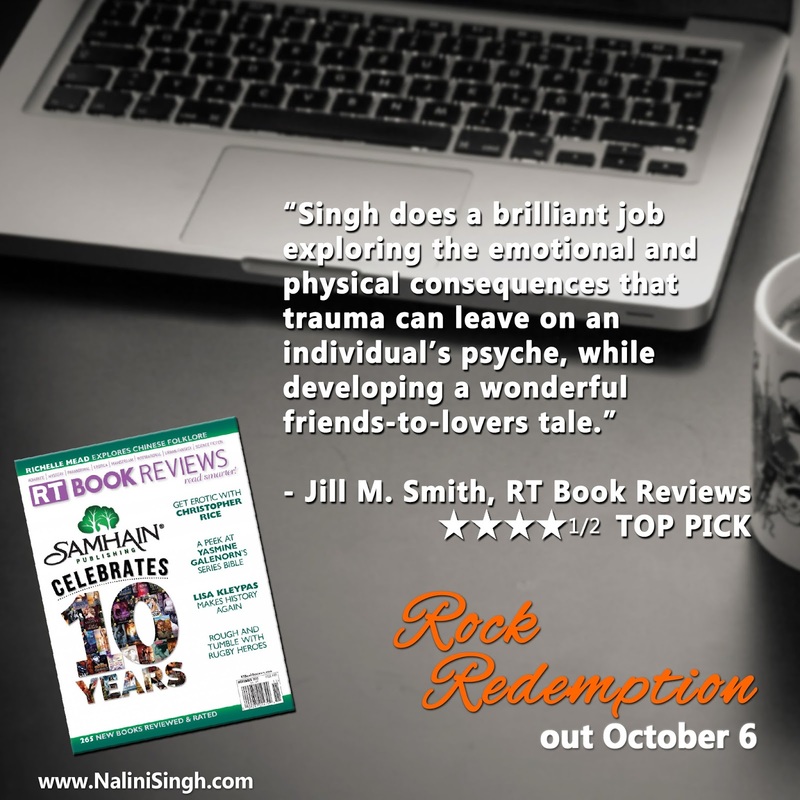 The fourth new excerpt from ROCK REDEMPTION is now live at Under the Covers Book Blog! You can also enter to win a signed copy of Rock Addiction. Enjoy! 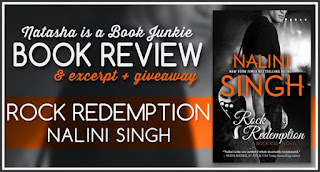 "...probably the strongest and most gut-wrenching installment in Nalini Singh’s Rock Kiss series yet." - Heroes & Heartbreakers has a wonderful in-depth review of Rock Redemption. 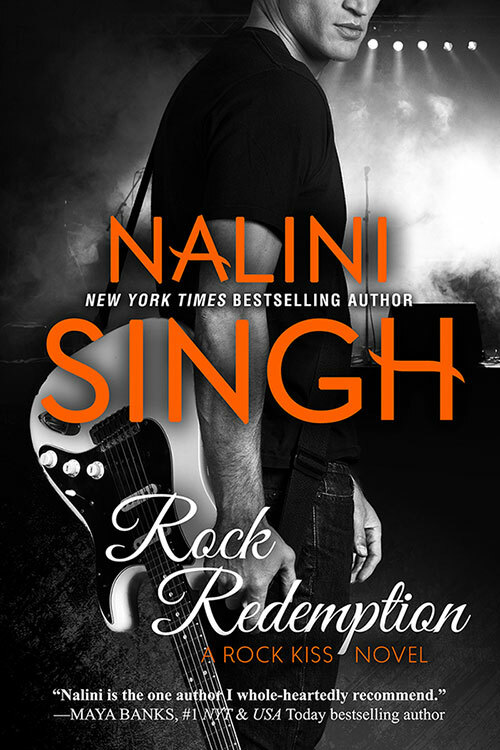 Today's new Rock Redemption excerpt is at Smexy Books! I hope you all love it! It continues on from excerpts 1 & 2.